Dr. Rishi Ramlogan analyzes the benefits, risks, and limitations of gastric bypass and gastric sleeve surgery in a side-by-side comparison. 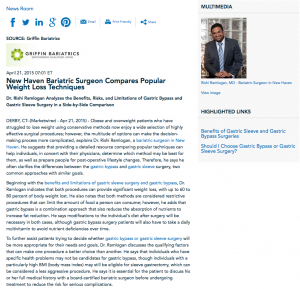 Derby, CT—Obese and overweight patients who have struggled to lose weight using conservative methods now enjoy a wide selection of highly effective surgical procedures; however, the multitude of options can make the decision-making process more complicated, explains Dr. Rishi Ramlogan, a bariatric surgeon in New Haven. He suggests that providing a detailed resource comparing popular techniques can help individuals, in concert with their physicians, determine which method may be best for them, as well as prepare people for post-operative lifestyle changes. Therefore, he says he often clarifies the differences between the gastric bypass and gastric sleeve surgery, two common approaches with similar goals. Beginning with the benefits and limitations of gastric sleeve surgery and gastric bypass, Dr. Ramlogan indicates that both procedures can provide significant weight loss, with up to 60 to 80 percent of body weight lost. He also notes that both methods are considered restrictive procedures that can limit the amount of food a person can consume; however, he adds that gastric bypass is a combination approach that also reduces the absorption of nutrients to increase fat reduction. He says modifications to the individual’s diet after surgery will be necessary in both cases, although gastric bypass surgery patients will also have to take a daily multivitamin to avoid nutrient deficiencies over time. To further assist patients trying to decide whether gastric bypass or gastric sleeve surgery will be more appropriate for their needs and goals, Dr. Ramlogan discusses the qualifying factors that can make one procedure a better choice than another. He says that individuals who have specific health problems may not be candidates for gastric bypass, though individuals with a particularly high BMI (body mass index) may still be eligible for sleeve gastrectomy, which can be considered a less aggressive procedure. He says it is essential for the patient to discuss his or her full medical history with a board-certified bariatric surgeon before undergoing treatment to reduce the risk for serious complications. Ultimately, Dr. Ramlogan believes that striving for comprehensive patient education is a vital component of a bariatric surgeon’s responsibilities, especially when an individual may be considering major surgery such as gastric bypass and gastric sleeve surgery. He explains that knowledgeable patients typically make better-informed decisions, and they often will achieve more successful results both in the short and long term. 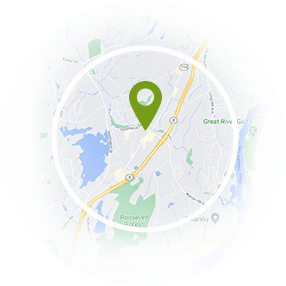 Dr. Ramlogan is a board-certified bariatric surgeon practicing in the Derby, New Haven, and Danbury, CT area. After receiving his medical degree from the University of the West Indies, he completed an internship followed by a residency at the Mount Sinai School of Medicine in New York, as well as additional training at New York Medical College (Sound Shore). He then relocated to Connecticut to complete fellowship training in advanced laparoscopy and bariatric surgery at Danbury Hospital. Dr. Ramlogan is available for interview upon request.